Soap Box Derby racing consists of a non-motorized car that is launched from a ramp on top of a hill. Gaining speeds at approximately 35 miles per hour, drivers are timed to determine the winner of each race. Double elimination is used to send a racer from the challenger bracket and off to win the overall heat. The Soap Box Derby is held at 19th Avenue North and 4th Street North. There is a 60 car limit, ages 6 – 16. There is an entry fee of $25 per person. The entry fee includes a car kit and building instructions. A waiver form must be filled out and signed by a parent/guardian prior to the race. All cars will be inspected prior to the race. Trophies are awarded for: 1st, and 2nd place. There are winners in each age group! An awards ceremony will be held at Central Park during the Families in the Park event. Come join us for this fun event! 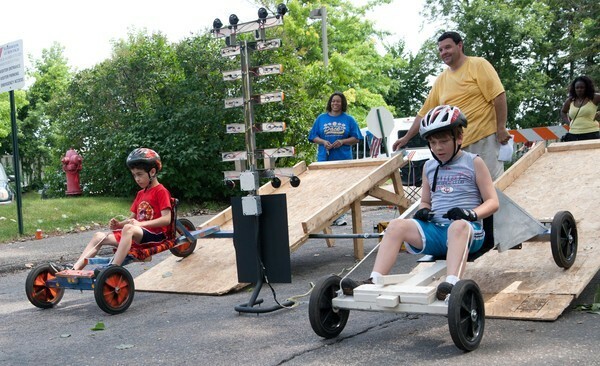 The Soap Box Derby is fun for the whole family! Register before July 14, 2019.